FBI Behavioral Analyst Kaely Quinn is the most sought-after profiler the FBI has seen, but she has an intriguing past—one that she fights to put behind her. Plus, her techniques to create a profile are unique, disturbing, and unheard of. However, she gets results. When a new case is thrust upon her, she must face her past and solve the riddle the UNSUB has created before the next victim is taken. Special Agent Noah Hunter is put in charge of the Elephant killer case and has to work with the controversial profiler, Kaely Quinn. This mystery is the most confusing one he’s tackled and they’re running out of time. Kaely’s life is in danger and he must solve the killer’s next move to save her. 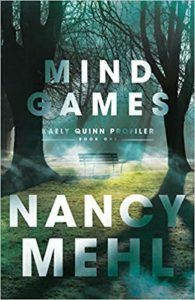 Mind Games is the first novel I’ve read by Nancy Mehl and I must say I’m now a fan! This book had me from the first page. It’s dark and creepy but intriguing. The plot will have you guessing until the end and also trying to figure out the mysterious poem the killer has penned. The characters are interesting and come to life on the page. Kaely is mysterious and will keep you on the edge of your seat. The reader will cheer for her and also hold their breath as the killer lurks close by. Noah is the protector every woman wants. The ending will give you goosebumps and make you think long into the night! I can’t wait for the next book in the series, Fire Storm, coming in August. I give Mind Games four stars. This is one book you might want to read with the light on!